Juanpa98ar 7 months, 1 week ago. Android Oreo 8.1 ROM, Moto G 2015 LineageOS 15.1 has now arrived via a development build. If you want the OFFICIAL Lineage OS update or some more Android Oreo ROMs then stay tuned to the Lineage OS 15 ROM page or the AOSP Android Oreo ROMs devices list page. This Lineage OS 15.1 for Moto G 2015 is brought to you by Alberto97 and one more build by althafvly. THIS IS AN INITIAL BUILD AND HAS MANY MORE BUGS. HAVE A BACKUP BEFORE FLASHING THIS AND TRY AT YOUR OWN RISK. Installing a custom ROM on a Moto G 2015 (osprey) requires the bootloader to be unlocked on the Moto G 2015 (osprey) phone, which may VOID your warranty and may delete all your data. Before proceeding further you may consider backup all data on the phone. You are the only person doing changes to your phone and I cannot be held responsible for the mistakes done by you. – Here is theTWRP update guide for the Moto G 2015. This TWRP recovery guide requires an unlocked bootloader on the Moto G 2015. Download and Copy the GApps and Moto G 2015 LineageOS 15.1 ROM ZIP to your phone. First flash the Moto G 2015 Lineage OS 15.1 ROM ZIP from device. Then flash the GApps zip from your device memory. Reboot and Enjoy the Oreo 8.1 LineageOS 15.1 ROM for Moto G 2015. 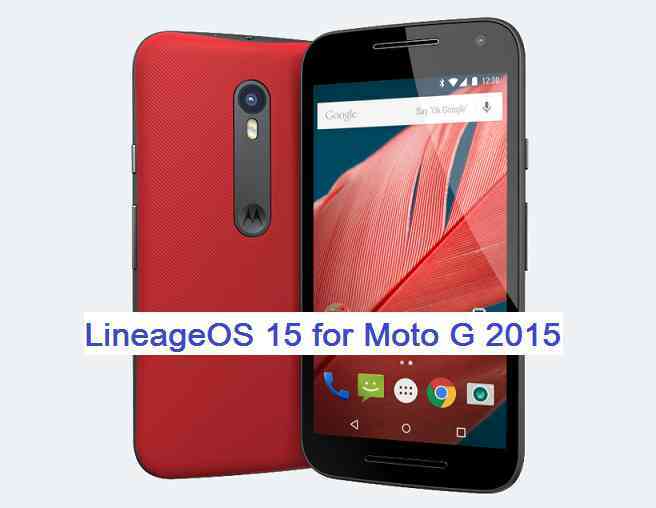 Copy the latest Moto G 2015 Lineage 15 ROM ZIP file to your phone. Stay tuned or Subscribe to the Moto G 2015 (osprey) forum For other Android Oreo, Nougat ROMs, LineageOS 15.1 ROMs, other ROMs and all other device specific topics. Hello, I wanted to report a bug in lineage os 15.1 by althafvly, the dev thread was for the version of alberto97. In my motorola g3 osprey after installing the rom the automatic rotation, the gestures for the flashlight and camera no longer worked, nor recognized the headphones. It was solved once I do not know how, but when restarting, the conflict returned. I hope this comment is of some use. This occurs in the latest version up to the date of lineage os 15.1 2018/07/30. The version of 2018/06/11 did not have these problems but it had a notable lack of performance.